We live with machines all around us. The fabric of our cities is made up of connected nodes that track weather, traffic, and commerce. These machines send us messages, tell us what to wear, show us entertainment, and monitor our behaviour. Our physical world is networked and made of code, and we usually don't even notice it. This is the programmable world, a world in which we now live. This webcast will examine different aspects and perspectives on the networked world, and specifically how designers play a part in shaping it. It will include discussion of new design skills approaches that help us work with these new technologies and systems. Matt Nish-Lapidus holds a degree in new media art, and has a rich background as a practicing musician and designer. His work has included everything from the digital library catalog in use by the New York Public Library, enterprise software for hospitals, video games, and large-scale public installations. He spent the first few years of his career assisting international new media artists, later moving into the design and technology industry. Matt loves to debate about art, politics, music, and just about anything else. 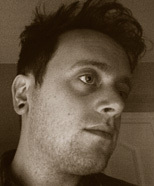 He currently leads a design team at Normative in Toronto, Canada where he focuses on design practice development in a 21st century studio and is also the Vice President of the Interaction Design Association (IxDA), a global organization dedicated to the development of the interaction design community of practice.